1. What is the Long Tail? By using the long tail of search you can instantly maximize your Google Adwords return on investment (ROI). But what is the Long Tail? In the early days of Google Adwords, and pay per click (PPC) marketing, competition for generic industry keywords such as "books", "shoes" or "laptops" was reasonably sparse in many industries and a good Adwords ROI was often very easy to achieve. It was safe to add a few of these keywords to an Adwords campaign, check on them once every few weeks or even months, and watch profitable conversions come rolling in. Over time more and more PPC advertisers came online, increasing competition for these general keywords and as a result increasing the cost per click (CPC) required to maintain visibility on the PPC search engines. Smart advertisers, using Google Adwords and other search engine PPC programs, quickly learnt that they needed to target more specific keywords such as "fishing books", "tennis shoes" or "dell laptops", where the competition was less fierce. These advertisers found that not only were the CPCs lower with these less generic words, but that they were able to target the advert creative more specifically to the user's requirements, with titles such as "Buy Fishing Books" instead of "Buy Books", which increased click-throughs. They also found that they were able to take the user directly from the advert to a page more relevant to the search query - such as a page on their site devoted to "Fishing Books". This increased conversions. The name of the long tail comes from the appearance of these keywords when plotted on a graph like the one above. The generic keywords on the left receive individually far more clicks than the specific keywords on the right. However, since there are more of the specific keywords (in reality stretching far off the edge of this page) it is possible to leverage the long tail to obtain as much or even more traffic for substantially less money. Mining the long tail has now become a science in itself, and advertisers are constantly striving to reach further and further into the long tail and increase their keyword coverage. On top of the benefits above, the long tail adds a special benefit to Google Adwords customers. As discussed in the first section, mining the long tail allows Google advertisers to create more specific advert text, which better matches the search query entered by the user. This increases the click through rate of the advert. Unlike many other search engines, Google ranks adverts not only by cost per click but also by the click through rate. This is based on the assumption that the higher the click through rate for a particular search term, the more relevant it is to the user. Because of this ranking algorithm it is possible for advertisers with a good click through rate to achieve a higher position for a lower CPC than their competition - and hence long tail adverts often appear higher in the Google results than general keywords, even though they are paying less per click. When mining the long tail the most obvious place to start is your product catalogue and list of categories. In this document we will continue with our example of a bookshop, but most of the techniques here can be used with any industry - be it retail or the service industry. We can start with broad keywords and categories for books, such as "Books", "Novels", "Non- Fiction", "Fiction", "Reference Books", "Bookshop" etc. Try and find synonyms for these terms too - such as "Novel" as well as "Novels", "Reference Works" as well as "Reference Books" or "Book shop" as well as "Bookshop". If you are unsure about these words you can use the Overture Keyword Suggestion tool. This keyword tool will give you suggestions on alternative keywords and also give you information on traffic received per keyword over a month. At this point, aim for general keywords that have high levels of traffic. 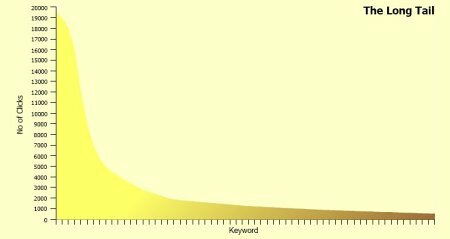 If you would like to test these keywords, you can add them to your Google Adwords account at a low cost per click, and see which ones receive the most impressions or clicks, and decide which ones are most important to your business - the quality of these keywords will be a vital part of your future long tail mining. Next we can add the shop categories, such as "Travel", "History", "Crime", "Mystery", "Thriller" etc. Often these categories will not be much use on their own - the keyword "Travel" may be highly expensive and inefficient for a bookshop. To make these into valid, usable keywords you can add the broad terms you decided on above, such as "Travel Books", "Travel Novels", "Travel Non-Fiction" and "Travel Reference Books". Depending on the number of categories that you have on your site, and the number of broad general terms that you used, you should end up with somewhere between 50 and 300 keywords. You can increase these further by investigating synonyms for each of the words, such as "Historical" instead of "History", or "Criminal" instead of "Crime". Finally, and most powerfully, you can leverage the power of your actual product database. You can start with keywords for individual authors (or manufacturers in a different industry), such as "Dan Brown", "Agatha Christie" or "Haruki Murakami". Add to these authors the broad terms ("Agatha Christie Book", "Dan Brown Novel" or "Haruki Murakami Fiction"), the category terms relevant to the particular product ("Haruki Murakami Mystery", "Dan Brown Thriller" or "Agatha Christie Crime"), and finally a mixture of the two ("Agatha Christie Crime Novel", "Haruki Murakami Mystery Fiction" or "Dan Brown Thriller Novel"). Depending on the number of authors or manufacturers you have in your database, you will now have thousands of keywords, which is why it is important to test the broad terms and category terms that work before you start. After this, you may like to extend further and include the individual product titles. For example "The Da Vinci Code", "The Body In the Library" and "The Wind-Up Bird Chronicle". Again, you can combine these with authors ("Haruki Murakami The Wind-Up Bird Chronicle"), broad terms ("The Body In the Library Book"), categories ("Da Vinci Code Thriller"), and a combinations of all of these. Depending on how far you would like to go and how relevant the data is to your industry you may like to be more specific than even the product title, and include terms such as the manufacturer part code or the ISBN. In many industries it is unlikely that the customer will be familiar with these details, but if your user-base is very technical or knowledgeable about the products they are wanting to purchase, they may search for these terms. These terms often have so little competition that you can usually achieve a low cost per click without extending them further with broad terms or category words. To continue reading about how optimising the long tail can benefit your business, and how the long tail can be implemented continue to read Google Adwords: Using the Long Tail to Optimize your Google Adwords ROI - Part 2. This continues to cover the following topics: Building the Long Tail: Localization, Building the Long Tail: Spelling Mistakes, Building the Long Tail: Call to Action Keywords and Adjectives, Testing PPC Creatives and Implementing and Managing the Long Tail. Sayu Ltd specialise in pay per click management services. By utilising advanced statistical techniques, long tail marketing and proprietary automated bidding software we can reduce overall advertising spend and increase the quantity and quality of traffic that is provided by a client's internet advertising campaigns.